On Sunday afternoons, I like to make a dish that Jeff and I can eat for lunches in the coming week. I try to make things that are interesting and satisfying enough that we won’t be dreading lunchtime come Wednesday, or worse yet, end up blowing money on lunch out. I also like to keep the cost to a minimum (of course). In the winter this usually means a rice and bean dish, soup, or chili of some sort. This week, it was arroz sin pollo, an inexpensive and nutritious dish that I made in the crockpot! Heat a bit of olive oil in a skillet over medium heat. Add the onion and carrot and cook until softened, about 5 minutes. Add the garlic, oregano, cumin, and turmeric and cook another 2 minutes. 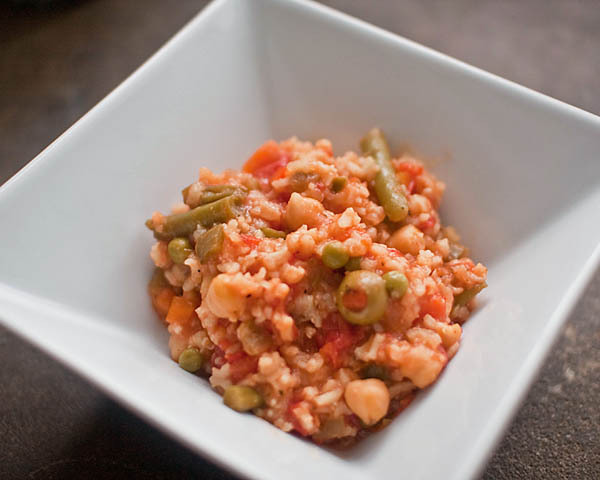 Transfer the cooked veggies to a crockpot that’s been sprayed with cooking spray, and add everything except the rice, salsa, peas, and olives. Cover and cook on low for 6-8 hours, or on high for 3-4 hours. 15 minutes before serving, stir in the remaining ingredients, cover and continue cooking until most of the liquid is absorbed by the rice.